Why does only one side of a neon lamp glow? 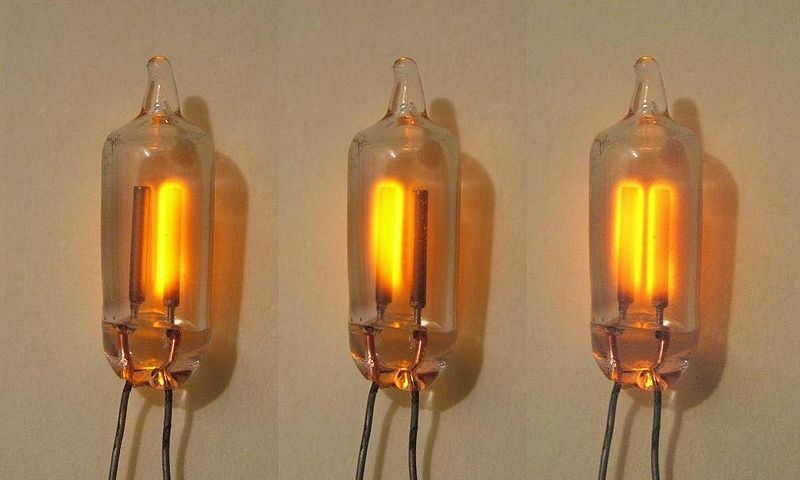 The voltages across the lamps are left: DC (left lead positive), middle: DC (right lead positive), and right: AC. But... why? The electrodes are the same shape, so the electric field around them should be the same shape, and the gas should break down in the regions at which the electric field strength is above some threshold, which seems like it would be symmetrical. Is there a difference in threshold between positive and negative coronas? If so, do both sides light up at high enough voltage? Or maybe only one type of corona is possible in neon since it's a noble gas? If it contained air would it glow at both electrodes? Do neon signs work in a different manner, since they have a long region of glowing gas, rather than just glowing near the cathode? The asymmetry comes from the different masses of electrons and neon ions (neon ions are about 36000 times heavier). This mass asymmetry results in different cross sections for the excitation of neon atoms by electrons and ions. There are some plots of this here (figure 1a for electrons, figure 1b for ions). The interesting processes of excitation occur above around 10eV for electrons and 100eV for ions. There is a very cool Java simulation of discharges: http://phet.colorado.edu/en/simulation/discharge-lamps . It covers electron excitation, the atomic structure of neon, acceleration and excitation cross-sections very well, and demonstrates why the glow can be localized (it glows at the point that electrons have been accelerated to the necessary energy), and why it is asymmetric (all electrons start from the cathode and can gain energy on the way to the anode). I hope this answers why only one side can glow. I wish I could explain exactly why the glow is next to the cathode in the picture, but I would just be guessing. It is the excited gas atoms which produce the glow by losing their excitation via the emission of photons. The atoms are principally excited via collisions with fast-moving gas ions and to a lesser extent with other (neutral) gas atoms, NOT with electrons (see above comments regarding scattering cross-sections). These ions do form via electron-atom collisions (principally near the anode where the electrons are moving fastest), and these collisions favor the gas losing an electron and becoming positively charged. (This is related to the cascade effect known as "Towsend discharge".) Thus positive ions get accelerated toward the cathode and are moving most quickly near the cathode, thereby transferring more kinetic energy to other gas atoms when they collide with them. These collided-atoms are thus excited and quickly shed photons. Sputtering. Some of the ions (and/or atoms they collide with) will impact the cathode itself, which will (with some probability) knock off atoms from the cathode itself and release them into the surrounding gas with in some cases significant velocity, and these cathode-ejecta-atoms in turn will collide with the gas and excite the gas atoms, which then emit photons and so forth. The basic process is described in the early section of the Glow Discharge Wikipedia article. In the Manitoba Grade 9 curriculum handbook, the following explanation is presented: "The neon bulb emits electrons from the negative electrode which crash into the neon atoms, emitting a reddish-orange glow at the negative cathode." I am presently taking my teacher certification and it seems I am expected to let my Grade 9 students figure this out for themselves by applying the Particle Model of electricity. Does anyone find this explanation convincing? Well, I guess, in the case of AC too, the lamp is glowing in only one electrode, but since its alternating at 50Hz( depends on your geography/country) the persistence of vision is making you see both of them glow at the same time. There is an article at Physics of Plasmas,Phys. Plasmas 19, 072113 (2012); http://dx.doi.org/10.1063/1.4737189, which explains the phenomenon discussed here. The physical mechanism behind neon glow is induced-dipole interaction. Unfortunately, it is too difficult to explain physics without any mathematics; and, one should refer to the article for details.The figure 3 in the article gives pictorial idea behind charged-particle oscillation. It's because the ion and electron densities are highest near the cathode (generating the glow) and flattening out away from the cathode. Not the answer you're looking for? Browse other questions tagged electromagnetism plasma-physics or ask your own question. What invisible flicker do different types of light bulbs have? Why doesn't a neon sign seem that hot? What phenomena occur in a low voltage arc between copper and graphite electrodes, and why is the result dependent on electrode polarity? May the total charge in a supercapacitor be different using unipolar and bipolar voltage power supply? Why does an oscillating electric field couple more strongly to electrons than to ions? Momentum when slow ion collides with fast electron? Why is there a color difference in DC glow discharge? Does the electric field crosses an infinite conductor from one side to the other?